2018 Maruti Suzuki Ertiga Vs. Mahindra Marazzo - Winner? 2018 Maruti Suzuki Ertiga vs. Mahindra Marazzo: Which one is the real winner? A car that brings your family together and strengthens the bond of love, the Maruti Suzuki Ertiga is unique in its own way. It has been in the news for quite a few times now and it is making the buzz for all the legitimate reasons. The face-lifted version of this car was recently unveiled in Indonesia and it quickly became the talk of the town. The car is all set to be launched in India at the end of 2018, but it can easily throw a challenge to the big players in the game. In this blog, we will talk about how the Maruti Suzuki Ertiga will rival Mahindra Marazzo and which car will edge past in this faceoff. The Marazzo is a totally different breed and it has been skillfully designed by M&M’s resources based in US, Italy and India. Marazzo is perfectly suited for the young buyer and this car scores high on space and style aspects. The multi-utility vehicle (MUV) will come only with a diesel engine, but the petrol engine will be added on later. The name Marazzo is very unique and it is a Spanish word for ‘shark’. After Honda decided to stop the production of Mobilio, after its poor market audience, M&M waited for almost a year to launch this one. Considering the fact that the Xylo is also struggling, Marazzo will precisely target the personal user. Why choose Maruti Suzuki Ertiga? The car went through a rigorous testing phase and the previous launch date of August 2018 was cancelled. Maruti Suzuki has decided to take advantage of the festive season and the car will be launched at an opportune time. The festivities bring many benefits and people are more likely to buy at this time period. A brand new platform – Maruti Suzuki choose the new Heartect platform for the Ertiga and this platform is also same as that of Swift and DZire. This unique platform adds to the rigidity factor and makes the vehicle much stronger. A stronger Hybrid engine – Whenever a new car hits the market, there is a lot of discussion about its engine and the same goes for the Maruti Suzuki Ertiga as well. The 2018 version of the car will feature a 1.5-litre diesel engine. As far as the petrol motor is concerned, Maruti will introduce a SHVS hybrid system, which will increase the efficiency. Rich in features – Considering the Maruti Suzuki Ertiga on road price, the features are simply outstanding. The dashboard is completely changed now and it contains the SmartPlay AVN infotainment system that is perfectly suitable for Apple and Android users. Projector headlmaps and LED DRLs are expected to be seen in top-end variants. Affordable Pricing – Considering the features on offer and the upgrade you are getting, the price of the Maruti Suzuki Ertiga will not put too much pressure on your protect. Most Popular: 5 Reasons Why You Should Buy Maruti Cars In This Festive Season? Apart from this, you can always get the best offers on Maruti cars from Premsons Motor and the best customer service. So visit our showroom at Ranchi or call +91 9308111111. Premsons Motors - One and only Platinum Club dealer in Jharkhand. No.1 in Customer Satisfaction. Call us at 9308111111. 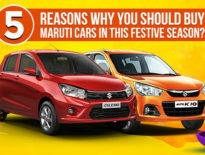 5 Reasons Why You Should Buy Maruti Cars In This Festive Season? Looking for a Car Loan?